It’s 2017. Both DIRECTV and DISH have had HD service for well over a decade. Your TV went digital eight years ago. Since the year 2000, when the future was supposed to start, you’ve probably had seven or eight phones, four or five internet upgrades, and a couple of cars. So why are you still watching TV like it’s 1999? This is the time to finally get rid of the round dish on your roof, on your RV, or on your boat. It’s time to say goodbye to tube TVs and “standard definition” service. Standard definition isn’t standard anymore, it’s low, and it’s time to make a change. Even if you don’t watch a lot of TV, at some point you just have to let go of that old tech. It’s just time. Isn’t it expensive to upgrade? Maybe you’ve been holding on to old equipment because you didn’t want to spend the money. Both DIRECTV and DISH have great upgrade programs now and there are “zero-dollar” deals out there. You have to know where to look and not everyone is going to qualify, and that’s why it’s important that you call Signal Connect at 866.726.4182. Our Signal professionals are ready to help you find the upgrade that makes the most sense to you. But… won’t I need to change my dish? Yes, most likely you will. You’ll need an HD-capable dish. But… I have an RV (or a boat.) That’s going to be expensive. Yes it’s true that mobile and marine dishes cost a lot more than regular satellite dishes and there isn’t a free upgrade program there. In some cases you can change carriers from DIRECTV to DISH and get away just upgrading the control unit, but in other cases you are going to end up with an out-of-pocket expense. 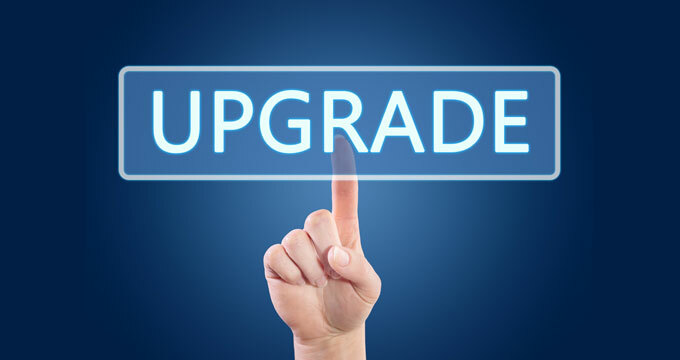 The thing to do here is remember that you’re making an upgrade that is likely to benefit you for over a decade, just like you did when you put that hardware on the RV or boat in the first place. If you look at it that way, the investment seems smaller. I’ve built my receiver into a custom-sized niche. What can I do? We’ve heard from our top-end customers that this is a problem. DIRECTV’s D12 is one of the most compact receivers out there and some of our marine customers have made custom enclosures for it. If you have an older, larger receiver like a DIRECTV R10 or DISH 311, the newer, smaller receivers will fit in the hole left behind by the old receiver and the most you’ll have to do is build something to make it look attractive. If you’re replacing a D12 with a DIRECTV HD receiver you may find it’s bigger in at least one dimension. It may be possible to put the receiver in sideways or hide it behind the TV and use an RF remote so that you can find an innovative way to put a receiver in a tiny space! DIRECTV is discontinuing “standard definition” service in 2019, and you don’t want to be without TV, even for a second. DISH has already stopped activating new SD customers and it’s only a matter of time before they stop all standard definition broadcasting as well. If you don’t do something now, you risk losing service the next time you want to watch TV. Here’s what you need to do, whether you’re on land, sea or on the road — call us at 866.726.4182 and let the professionals guide you through the process. Our team has upgraded literally thousands of customers just like you and we can make the process as painless as possible, from getting you all the upgrades you deserve to sending a certified installer who specializes in your situation. It all starts with a call! Can you use a Bell Satellite System in the US? Will DIRECTV ever have a new over-the-air adapter? SWM 101: How can you use SWM to watch programs in other rooms?